Steve and Rae Ann Gruver testified in favor of an anti-hazing bill in the Louisiana House Criminal Justice Committee on Wednesday, March 21, 2018. Their son Max was a victim of hazing at Louisiana State University. He died Sept. 14, 2017. His photo sits on the table. BATON ROUGE — Hazing by college fraternities would become a felony in a bill that cleared a Louisiana legislative panel Wednesday after powerful testimony from the parents of a hazing victim. The bill, House Bill 78, would affect all educational organizations and clubs. It also would make the organizations and universities criminally liable if they knew of hazing and didn't report it to authorities. Under current Louisiana law, hazing is a misdemeanor punishable by a fine of up to $100 and up to 30 days in jail. "Our family is broken," said Rae Ann Gruver, whose son Max, 18, died after a hazing incident at Louisiana State University last fall. "We will never be the same. How do we face every day knowing our son was killed so senselessly?" If the bill, sponsored by state Rep. Nancy Landry, a Republican from Lafayette, were to become law, the penalties for hazing if someone is injured, dies or has a blood alcohol content of 0.25% or above would increase to a maximum $10,000 fine and up to five years in jail. Gruver recounted the night of Sept. 14 when her son, a Phi Delta Theta fraternity pledge, was forced to take 10 to 12 long drinks of alcohol before being left on a couch unconscious. Max Gruver's blood-alcohol level was 0.496%, more than six times Louisiana's legal driving limit. "My son choked on his own vomit," Gruver said. Other anti-hazing bills also are moving through the state Legislature. In Senate Bill 91, anyone found responsible for a hazing-related death could face additional legal damages in civil court. That bill moved out of a Senate committee Tuesday. Also, House Bill 446 would require anyone who engages in reckless behavior that results in injury to another person to immediately seek or report the need for medical assistance. It was moved out of committee favorably Wednesday. 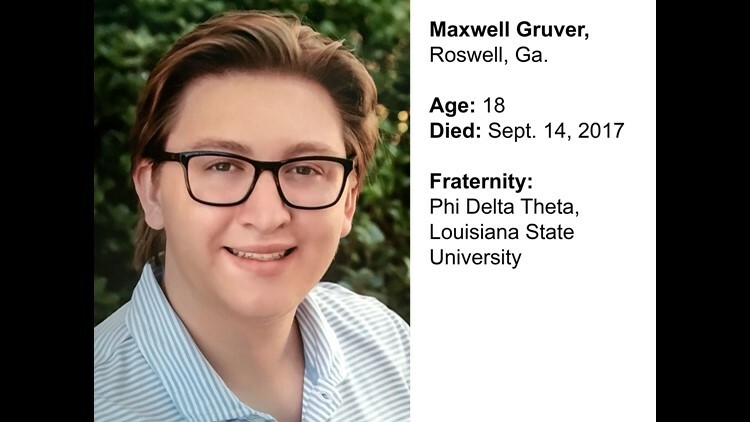 Maxwell Gruver, 18, of Roswell, Ga., died of alcohol poisoning after being coerced to drink 10 to 12 "pulls" of a 190-proof liquor. The Gruvers, who live in Roswell, Ga., said they believe Landry's bill could become a model for the rest of the country. A grand jury indicted four former LSU students in the Gruver case March 15 — three under the current misdemeanor hazing law and one charged with negligent homicide. East Baton Rouge District Attorney Hillar Moore, whose office is handling the Gruver case, testified in favor of Landry's bill. "(Hazing) is 100% preventable, and this legislation properly addresses the behavior and will act as a deterrent," Moore said. A bicyclist rides past Pennsylvania State University's shuttered Beta Theta Pi fraternity house Nov. 9, 2017, in State College, Pa.
Maxwell Gruver, 18, of Roswell, Ga., had hoped to become a member of Phi Delta Theta fraternity at Louisiana State University in Baton Rouge, La., but died Sept. 14, 2017, after ingesting too much alcohol. Andrew Coffey, 20, of Pompano Beach, Fla., died while attending a fraternity party at Florida State University in Tallahassee. This Nov. 3, 2017, photo shows the Pi Kappa Phi fraternity house near the Florida State University campus in Tallahassee, where pledge Andrew Coffey died Nov. 3, 2017, after a party the previous night.